I’m not a big fan of Cupid and his arrows. I do, on the other hand, love flowers, hearts and all things sweet – conversation heart candies, chocolates, cookies, cupcakes… I love ’em all! 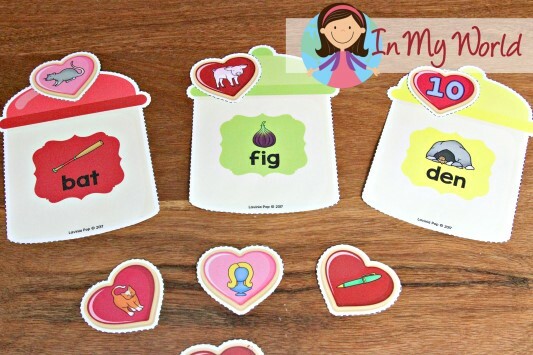 And you have guessed right that I included all those things in my new Valentine’s Day activity packet for your preschool or kinder (prep) kiddos! 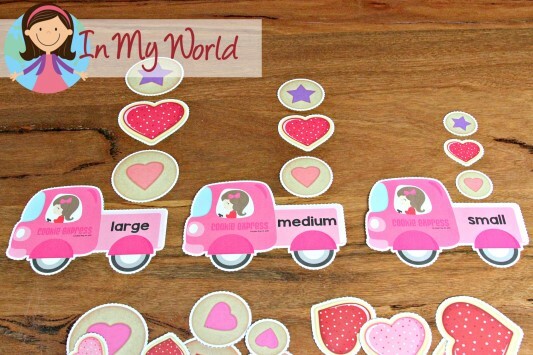 PLEASE NOTE: This blog post contains sample pages from my Valentine’s Day Preschool Centers packet. You can download the free sample pages by click on the photos. 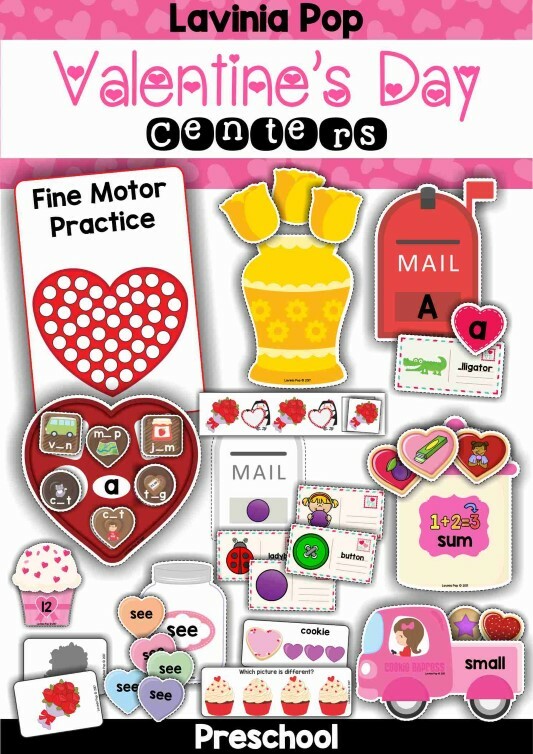 To purchase the complete Valentine’s Day Preschool Centers packet, please click here! My favourite activity from this packet is the sight words conversation hearts sorting activity. 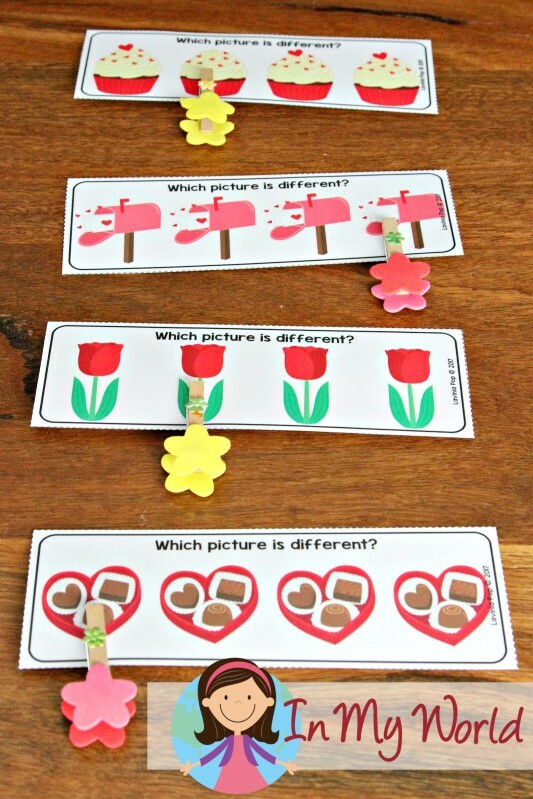 You can prep the activity by simply laminating and cutting all the pieces and then asking kiddos to sort the hearts to the correct jar. 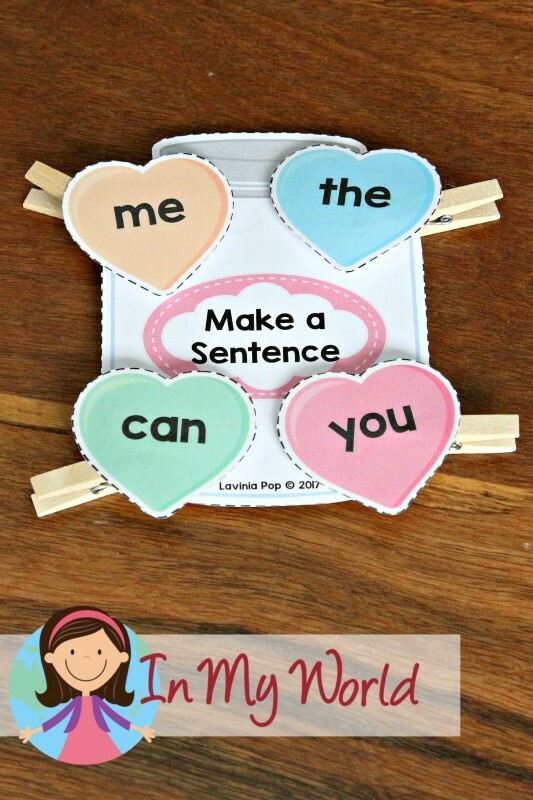 If your kiddos are ready, you can step it up a bit and ask them to make sentences using the sight words candy hearts. Glue the hearts to the ends of small clothes pegs and clip them to the jar. Ask children to make a sentence for each word. Okie dokie. Now that I’ve shown you my favourite activity, we can move on to see what else is included. 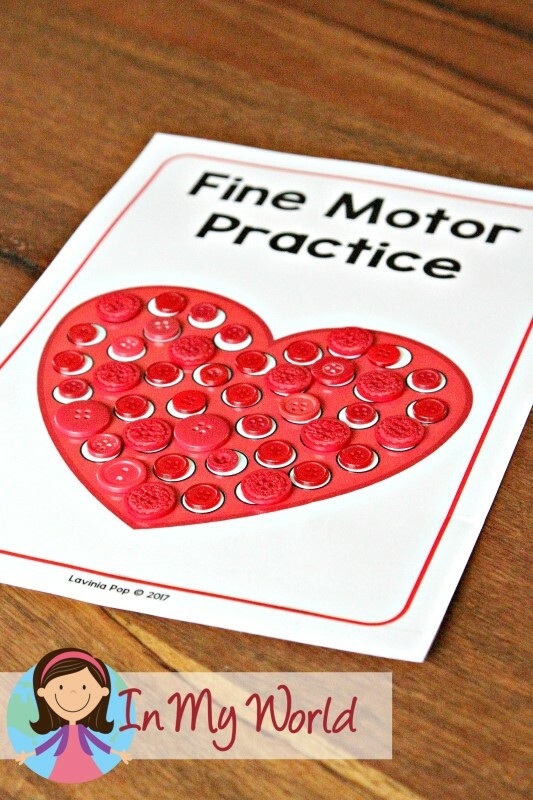 The first activity is a fine motor practice mat. 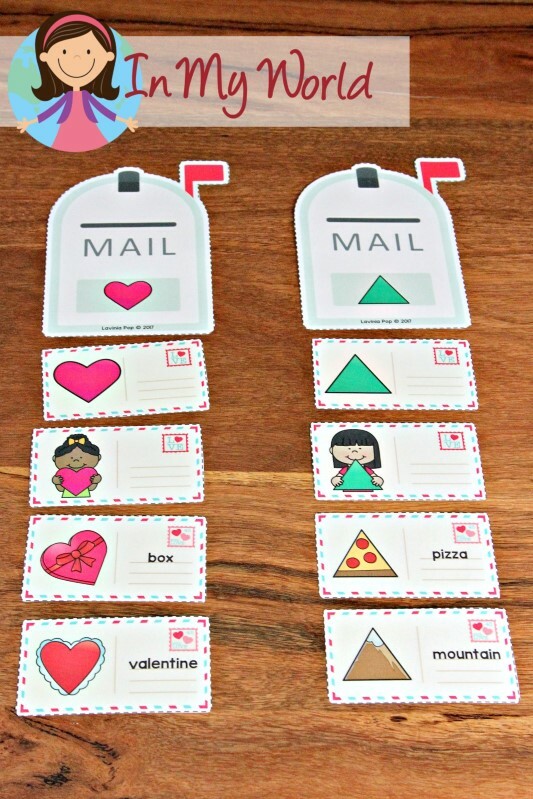 Then there is a Valentine mail sorting activity. 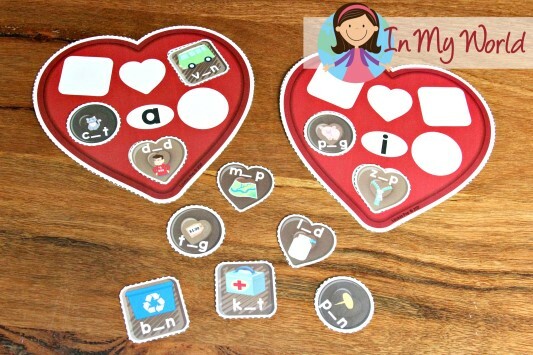 Children are required to match the lower case letter on the valentine and the beginning sound picture envelope to the correct mailbox. 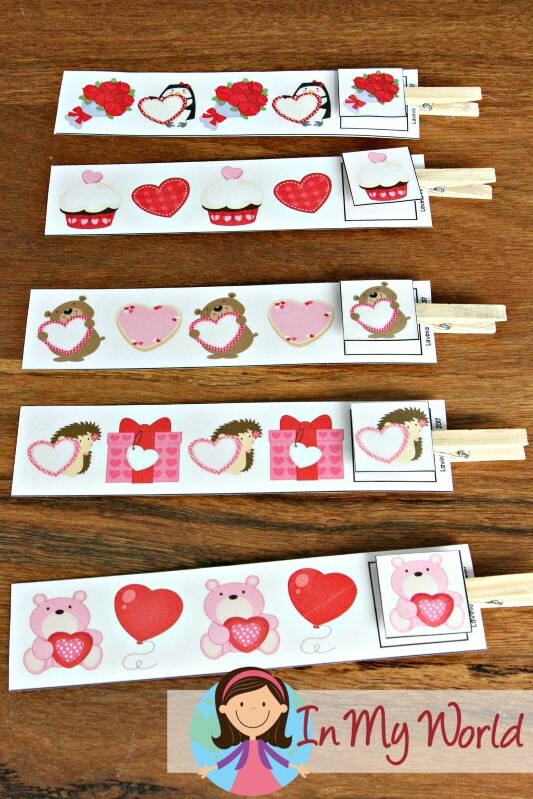 You can prep the activity by simply laminating and cutting, or you can make it a little more interactive by cutting a slot for children to slip the envelope and valentine into the mailbox. I placed a container behind the mailbox to receive the incoming mail. Next, I included a syllable counting activity. 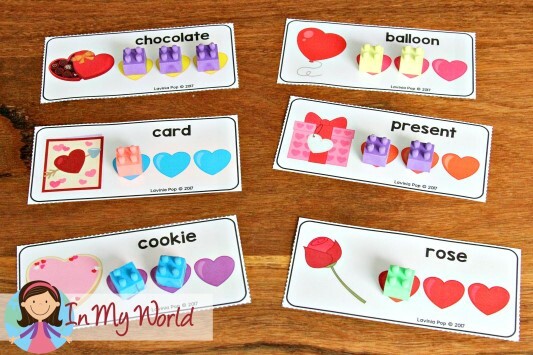 Children show their answers by clipping pegs to each heart or using counters to place on each heart. Then there is a chocolate box activity! I am sure this will be a deliciously fun activity for your kiddos! The aim here is for children to sort the chocolates to correct middle sound box. Mmmm… valentine cookies! 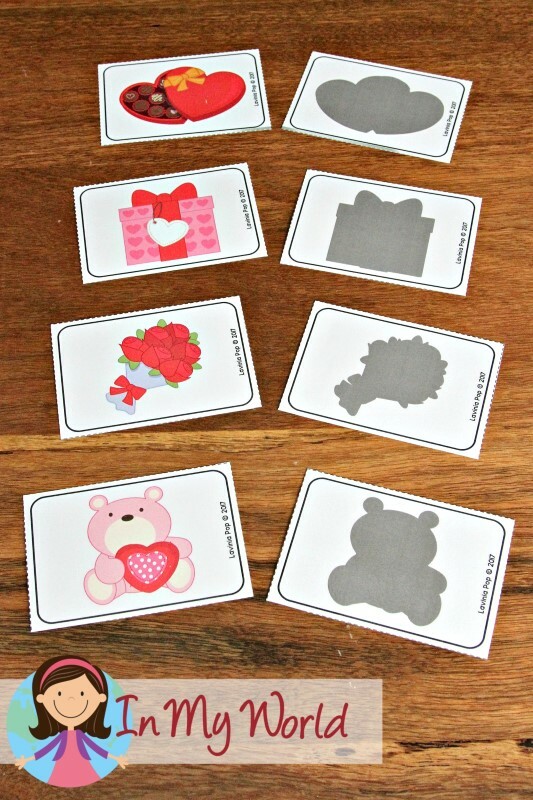 For this activity, children will be sorting cookies to their rhyming jar. For the next activity, I glued the rose heads to some icy-pole/popsicle sticks. I then attached the vases to some tall cups. The aim here is to, of course, match the coloured roses to the correct vase. You can also use coloured cups without the vases, or forgo the cup altogether and have the use the vases as sorting mats. The next activity has children counting the sprinkles on top of each cupcake and matching it to the base with the correct number. After, is a size sorting activity – children sort the cookies to the correct delivery van. Next, is a shape sorting activity. As with the alphabet mailboxes, you can make this more interactive by cutting slots in each box and having children put each envelope into the correct box. … as well as shadow matching cards. To finish off the packet, I also included an AB pattern activity. 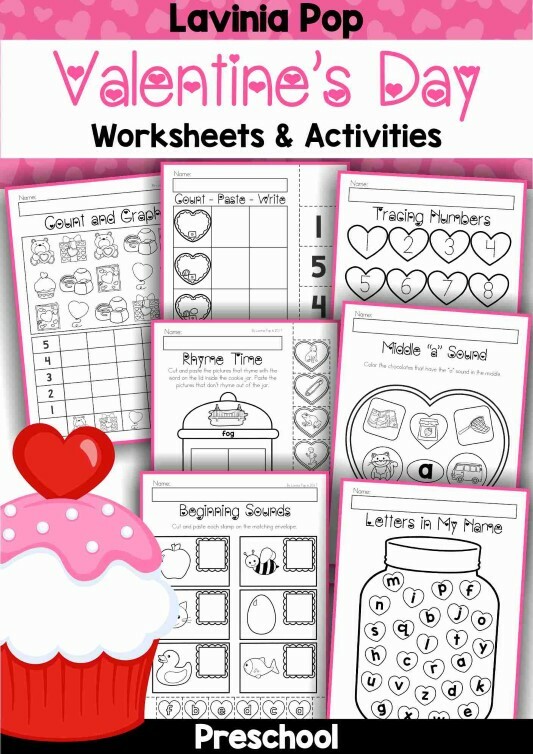 If you liked the samples from this post, you can purchase the complete Valentine’s Day Preschool Centers packet by click the picture below. If you’re thinking: “Wow! This packet requires too much prep time,” you might perhaps like the Valentine’s Day worksheets packet below. Click the picture to check it out in my Tpt store. While there, be sure to download the preview to check out some sample pages! thank you so much for these, will be trying out the free samples asap, I really appreciate the chance to try things out as I’ve made a few bum purchases where I can only use 5% of the pack. How do you get this printable? The activity that has children counting the sprinkles on top of each cupcake and matching it to the base with the correct number only had 1-4. These are wonderful! Thank you for your creativity & generosity and sharing them. 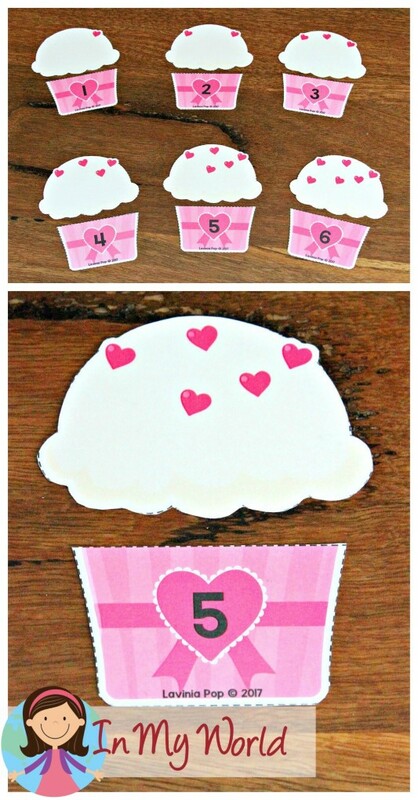 I did want to mention what it looks like Janice has already mentioned (the cupcake counting activity only includes numbers 1-4) but also that the last couple of activities are not clickable to the printables for me. Not sure if that’s just on my end? I hope it can be fixed b/c they’re so cute! Thank you! I’m so sorry! I have fixed the cupcake error and now displays the correct wording (1-4). There are only a few resources I have selected to give out as free samples; to access them all, you will need to purchase the packet.